Two very beautiful Cypripediums hail from east Asia – C. japonicum and C. formosanum – and are the only members of the genus from the section Flabellinervia. Considered by most taxonomists to be distinct, C. formosanum is so closely related to C. japonicum that some believe it to be a variety of its larger cousin. They are different in regard to stature, flower color and shape, and importantly, ease of culture. Having grown these plants for the past 7 years, I have experience in their needs and tolerances in the garden. Let’s have a look at C. formosanum first. C. formosanum is endemic to the higher elevations of Taiwan’s central mountains where it is has become very rare due to collecting pressure. Thankfully, it is a pretty easy species in the garden and a natural clumper. Due to its restricted range, it most likely is a relic population and derived from the more widespread C. japonicum. Despite the fact that its distribution straddles the Tropic of Cancer, it is in fact a temperate plant given that it grows only at high altitude in its native range (2000-3000 meters). 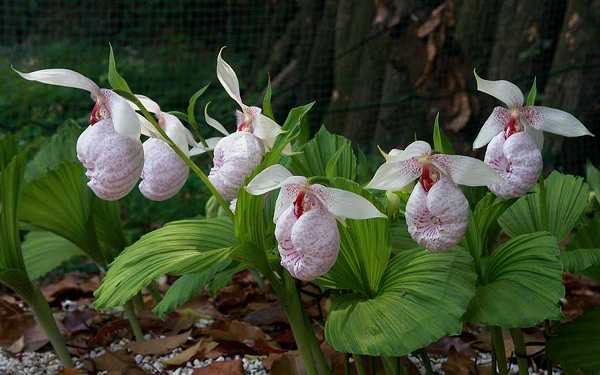 Cypripedium formosanum is one of the prettiest Cyp species. This species is a deciduous terrestrial herb. Its two broad fan-like, pleated leaves grow opposed to each other at the center of a lightly pubescent stem, and are up to 15 cm across each. The stem continues on to support one flower and its floral bract with the total height ranging between 14-25 cm. The flower has an inflated lip with an oval, almost barbed orifice at its front. The slipper-shaped flowers have a pink base color throughout with darker purple-pink spots and mottling. These form striations within the lip orifice and are also more concentrated at the base of the petals and dorsal sepal. The petals are quite broad and the lip has an inflated, puffy look. The staminode (a shield shaped structure covering and attached to the column) is a deep reddish-purple color. Pure white forms exist and are as rare as hen’s teeth. 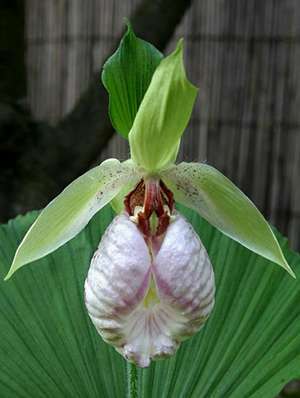 Cypripedium japonicum has bright apple green sepals and petals and a less inflated lip than C. formosanum. The plants grow from long stoloniferous rhizomes with new growths being up to 10 cm or so from the previous year’s growth (this section of rhizome is called the internode). At the base of each growth at the point of attachment to the rhizome (the node) are a clump of short, branch less roots (10-20 cm long). The rhizomes themselves are often branching and in time plants can form large continuous colonies over wide areas. I started growing this plant around 7 years ago, first in pots and then in the garden. While the pot grown plants remain fairly healthy, they flower poorly and do not multiply growths. By comparison a plant with a single nonflowering stem was put in a raised bed and has grown to 10 growths and 9 flowers in just 5 years. The problem for the pot grown plants seems to be hot roots during the growing season. Pots can heat up in summer even in temperate climates, but in southern Japan’s subtropical summer heat the effect is more pronounced. 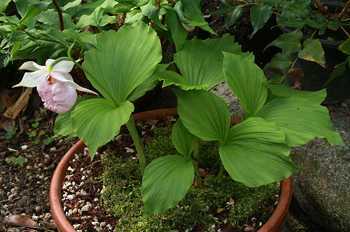 Still, the pot grown plants have persisted through the years and that speaks to this species’ ability to withstand conditions beyond what most Cypripediums can endure. This bed of both species is in its third year. The plants are facing in the direction of the light. C. japoncium is a far ranging species found over a large area in central China, the Korean Peninsula, and throughout the mainland islands of Japan. Interestingly, it is completely absent from Taiwan. Still fairly common in parts of its range, it is becoming increasingly rare from collecting pressure. This species in particular has been difficult to grow from seed, so virtually all plants being grown are either wild collected or divisions of wild plants. Germination in vitro has been spotty at best, with green pods giving the best yields. Like C. formosanum, it is a temperate species, but can endure hot summer conditions and thrive. 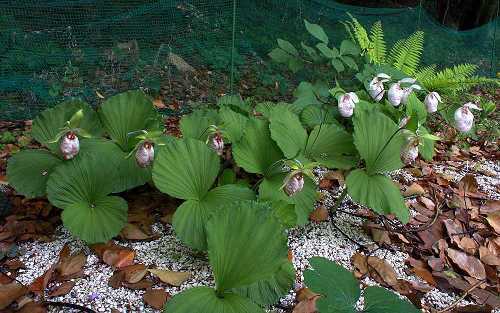 These pot grown Cypripedium formosanum are in their 7th year and are much less vigorous than ones grown in the ground.. The plant itself is very similar to C. formosanum, but is larger in all respects. Large specimens are often half again the size of its southern neighbor, some standing up to nearly 50 cm high. The stem too is thicker and more pubescent. 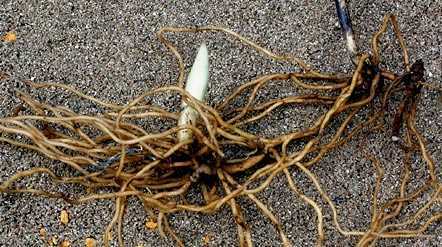 Similarly, the length of internodes on the rhizome is greater, with as much as 20 cm between growths. The flower is similar size, but different in color and form. The lip has an overall pink base color, but usually not as pastel pink as C. formosanum, and is suffused with purple-red striations and blotches particularly around the lip orifice which is front facing (as in C. formosanum). Chinese specimens tend to have more purple-red color than Japanese plants. The lip shape is a bit more elongate and has prominent “horns” around its orifice. The sepals and petals have a pleasant light apple green color with a few purple speckles at their bases as well as light green hairs. Alba forms do exist and are exquisite as well as expensive. A flowering size division will set you back $700-$1000 per even here in Japan. The plant being more robust than C. formosanum, can form even larger colonies with thousands of flowering stems represented at just one site. The large pleated leaves of Cypripedium japonicum are lovely in and of themselves. I’ve grown C. japonicum for five years now and had mixed luck. They tend to not do too well one year after transplanting, then pick up steam the second season, and start to kick into high gear the third. This year (2011) there are 24 stems in all with a total of 10 buds – 3 were taken before opening because they were new plants, 1 bud aborted, and 6 flowered. Next year there should be a larger crop. I’ve had to be patient with these beauties! An important issue with C. japonicum is getting divisions with at least one complete internode, that is, the new growth bud for next year and its roots as well as the older node with its finished growth from that season and its roots (which should be healthy still). If you get a division with just the new growth bud and roots, it will probably not do well, and may even die. The rootstock of Cypripedium japoncium showing this season’s growth (right), the long internode between growths, and next year’s growth bud (left) and roots. Such a division will transplant well. I grow both species in a raised bed on the edge of a woodland. The base of the bed is native soil (a sticky volcanic loam), while the top half is a mix of the native soil, kanuma, and composted wood and leaves. Over this is a 1 cm thick layer of pumice to prevent leaf rot when the monsoon rains come in June. Neither likes sun, but morning sun is OK before the heat of the day sets in. They can endure and even flower in deep shade, unlike most other Cypripediums, however bright shade is optimal. Fortunately, neither require a long, cold winter to vernalize well. All that is needed is 3 months below 10 C (50F). Likewise, though they don’t prefer it, both can withstand very hot temperatures in summer. The summer of 2010 was the hottest on record for my area with an average temperature of 30.4 C (86.7 F) for the month of August – they made it through without a hitch. One thing – like all Cyps they do not like hot roots and so in warm climates growing them in pots is a bad idea. It is worth noting that C. formosanum is a tad cold sensitive, so be careful that they are either well mulched in winter or put in a frost free cold room for their rest. In nature C. japonicum are often found on moist to wet seepy areas on a strong slope, hence a seeming contradiction of near wetness and drainage is to their liking. Given the plant’s need of high moisture, I would say that growing them in a Holman type bog could be useful. While both species must not dry out, C. japonicum in particular hates dry roots. 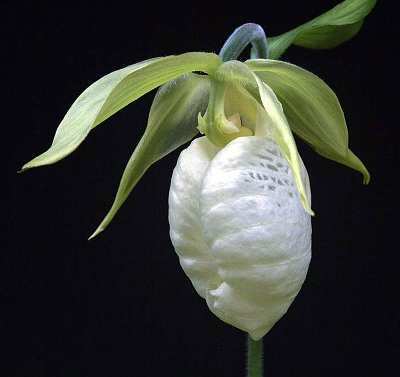 The rare alba form of Cypripedium japonicum remains sought after and pricey even in Japan. Another issue is they are heavy feeders due to their vigorous habit. 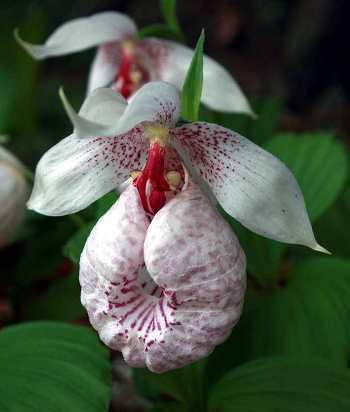 I fertilize often while in growth, and with a stronger dose than other lady slipper orchids. Of course, constant flushing of the growing media is necessary to avoid salt build up if you are using inorganic fertilizer. I avoid this by using pelleted organic fertilizer. Fish emulsion as well could be used. Another possibility is to increase the amount of organic matter you use, but be careful, too much and you may run into rot problems. The biggest difference between the two other than looks is their ease of culture. Hands down, C. formosanum is easier and can even take a fair amount of abuse before dying outright. C. japonicum is the bigger, spoiled sister to be sure. Important to note is that C. formosanum is less cold hardy which isn’t surprising given its home on the very edge of the tropics (albeit at high altitude). If grown in a greenhouse it can stay green from late February through early December. C. japonicum grows well up into Hokkaido where winters are far more severe, but it too can stay green from April to mid November. In general C. formosanum is a USDA cold hardiness zone 6b-8a plant while C. japonicum will grow from zone 5a-8a. Probably zone 7 is best for both species though, at least in the eastern USA. Where cooler summers prevail and the winter rest is adequate, zone 9 is fine too (such as coastal California). While both are charming, I recommend you start with C. formosanum first. In fact, it is truly a good Cyp to start with, period. C. japonicum is a bigger challenge, so I’d try some of the easier species before tackling this one. This clump of Cypripedium formosanum started as a single, unflowered growth just 5 years ago. We are geo sung trading company in Korea. I would like to know if we can export. I’m sorry, but I am not involved in selling seeds or plants overseas. It may be difficult to find someone who will be willing to send orchid seed out of Japan. C. japonicum is a very difficult species to germinate from mature seed, in fact I’ve not heard of any success stories yet. Your best chance is to obtain plants within your country, self pollinate them, and sow the embryos from green pods (around 6 weeks after pollination should work). The most important thing is to keep the growing medium evenly moist year round and try to keep the humidity high near the plants (50% or better). They can take a lot of heat, but need a true winter rest of at least 2-3 months. In nature they are found on moderately acidic soils, say in the 5-6 pH range. I’m glad you are enjoying the videos. Hello Tom, thank you for many advices you post here. I start to plant C. japonicum here in Sapporo, Hokkaido. And as you said C. formosanum is easier one, could you suggest the nurseries in Japan where I could get the division of formosanum? I recommend looking for divisions of C. formosanum on yahoo auctions or other online auctions. They are most available in the winter and early spring. One thing, be careful about planting this species in the ground in your area since it may not be fully cold hardy. I would grow them in a very large container and keep it in a cool place (less than 10 C) during the winter that doesn’t seriously freeze. A cold winter outside might kill this one. Enjoy growing these beauties! Many thanks Tom, I’ll check it out in auctions when the winter comes. kind regards. I planted these two species in big container and i put it indoor. During the winter dormant like now in Sapporo, is it need watering if the media becomes dry? What temperature are you storing them? It should be on average not more than around 5 C for 2-3 months minimum to vernalize them correctly. Above that and they will start growing prematurely. Both species cannot take any drying, so yes, keep them moist at all times. C. japonicum in particular cannot withstand ANY drying, or they will die for sure. I’ve lost newly planted ones outside during high winds in the spring that dried them out. Good luck! Thank you Tom for the infos. well let’s say average is 2 deg, sometimes it could freeze to -5 deg indoor. 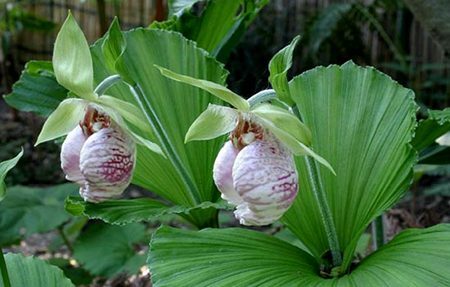 Cypripedium japonicum is very easy in cultivation when grown in 100% moderately decomposed organic soil. 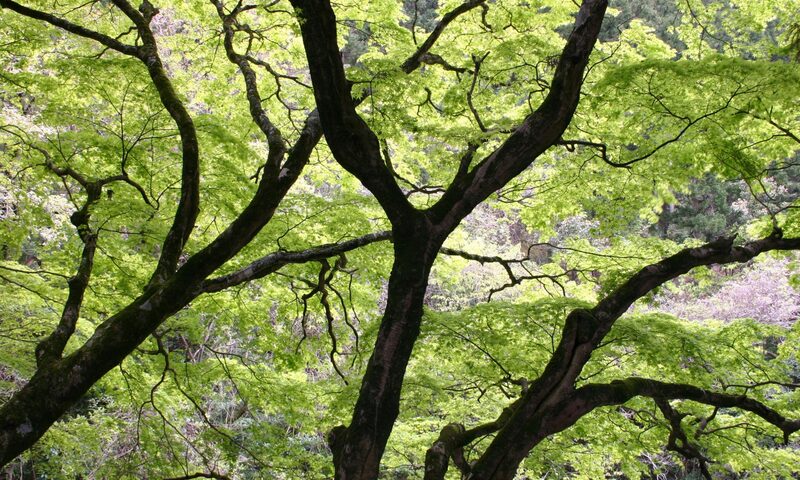 I recommend pure touchwood from a leafy tree and it will grow like a charm. It is common mistake to give mineral ingredients or generally mineral mixtures for that species. In such soil watering is also no problem. To provide good aeration of such soil I recommend putting some fresh twigs, which won’t decompose in years.